Beloved Cardinal manager Dorrel “Whitey” Herzog enjoyed a solid eight-year playing career from 1956 to 1963, but in his own words, “Baseball has been good to me since I quit trying to play it.” He managed the Kansas City Royals to three straight division titles from 1976 to 1978 and was hired as Cardinal manager in 1980. His brand of “Whiteyball,” based on speed, defense and pitching, electrified Cardinal fans for 10 seasons. 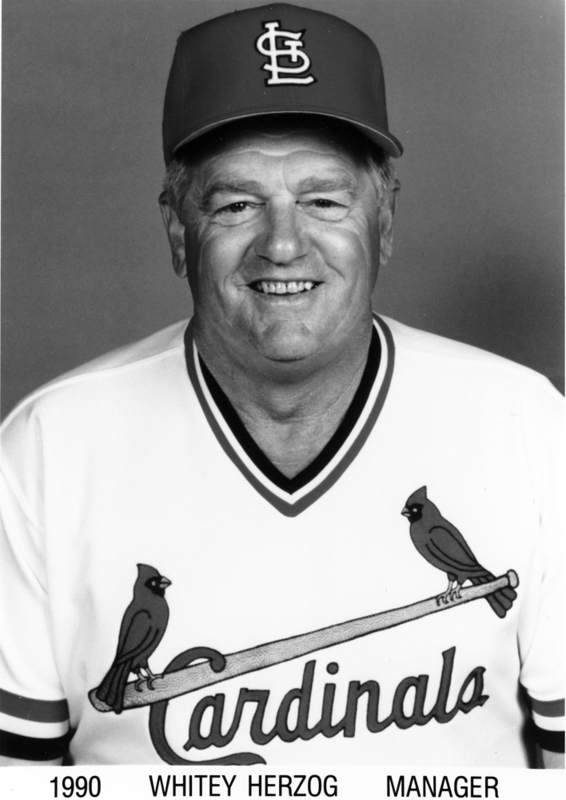 Herzog won three pennants and the 1982 World Series title with the Cardinals, and was named National League manager of the year in 1985. Finishing his managerial career with 1,281 wins and a .532 winning percentage, Whitey Herzog was inducted into the Baseball Hall of Fame in 2010.